Speed, speed, speed! It’s all we crave, and nothing hinders performance quite like the conventional hard drive. 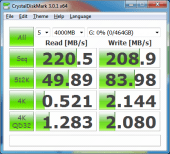 Over the years we’ve developed methods to increase hard drive speed, such as RAID, but nothing has quite stirred up this struggle as much as the Solid State Drive (SSD). Since their arrival into the mainstream, enthusiasts have been waiting very patiently for SSD prices to drop in order to reap their insane speed benefits. Right now, it’s just way to much money per gigabyte, and we like our cheap storage space. 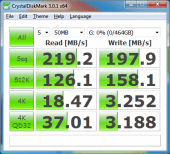 Almost two years ago, Artiom wrote an extremely popular editorial about short-stroking a Seagate 1.5TB hard drive to bring it’s performance closer to a Western Digital Raptor drive. This proved to be an extremely cheap way to get much faster speeds without forking over the cash for a Raptor, let alone an SSD (which at the time were even more expensive per gigabyte). Artiom then took the price of speed further by combining two Western Digital VelociRaptors in a RAID 0 and comparing them to an SSD. 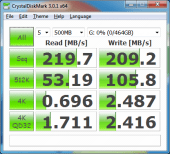 He got some great SSD class performance and didn’t haven’t to sacrifice much storage. 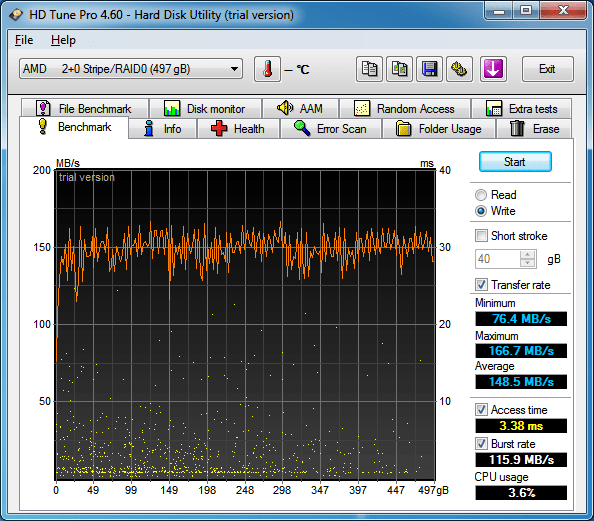 Now we are going to take it a little further with the Seagate Momentus XT Hybrid drive. This little guy is a standard 2.5″ 7200 RPM laptop drive with 32MB caches and a beautiful 4GB SSD attached. 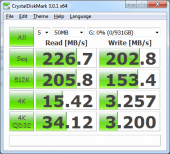 This SSD brings the performance up considerably. So, what are we going to do with it? Well Seagate gave us two, so we are going to RAID them in a RAID 0 and short stroke them to see what kind of performance we can get. Just like Artiom did with the VelociRaptor. We are directly comparing this to the Patriot Torqx 256GB SSD in Artiom’s last editorial. To reiterate, I’m going to setup the Momentus XTs in a RAID 0 and benchmark their performance. I will then short-stroke that same RAID 0 setup to see the change in performance. 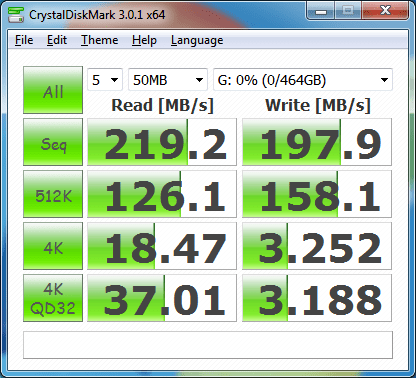 These tests will be compared to the results that Artiom got with the Patriot Torqx 256GB SSD. For those unfamiliar with this term, short-stroking a drive is when you limit it’s capacity in a way that forces only the innermost part of the platter to be used allowing the needle to move shorter distances with the intent of decreasing seek times.. This comes at a sacrifice in storage; with this test we will lose half our total capacity. I followed Artiom’s directions for short-stroking. Before testing, I made sure I had the latest firmware for the drives. Turns out Seagate does have a firmware update for these and you should make sure you have the latest version for optimum results. I was reading their feedback page and people were saying that Mac performance was increased with the firmware updates as well as other performance issues. Artiom was able to get some great scores with the Raptors. In fact, the Raptors beat the Patriot Torqx by a lot. It was a great way to get a lot of performance on the cheap. 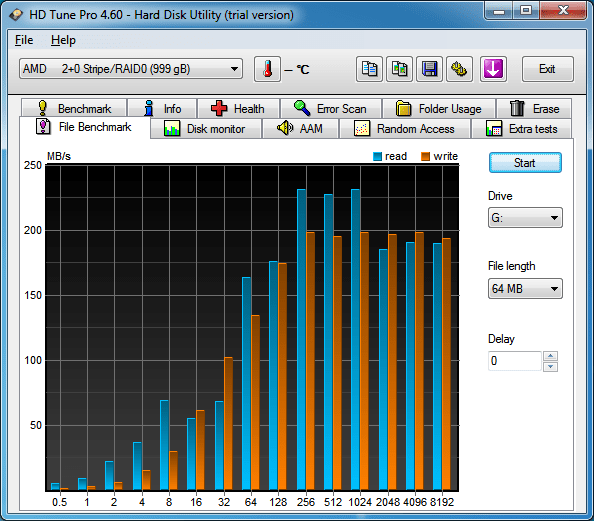 Here we are just going to be comparing the Momentus XT to the SSDs. 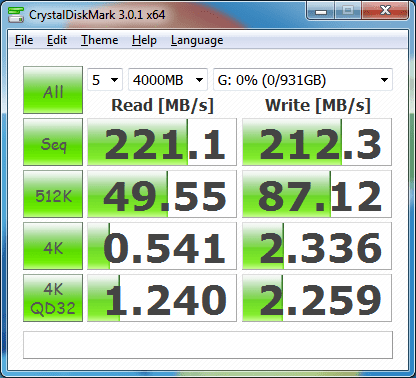 I’m going to state the SSD results as an average. 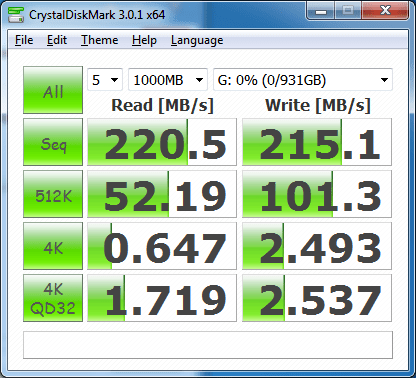 In CrystalDiskMark, the SSD had an average read/write result of ~231MB/s and 149MB/s. Our Momentus XT RAID0 received an average score of 219MB/s and 206MB/s while short stroked and 221MB/s and 210MB/s not short stroked. Short-stroking does not really increase performance here, but seek times were most likely reduced. The biggest thing to observe is the greater write speeds with the Momentus XT. 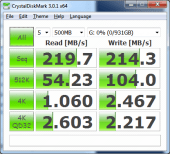 The Momentus XT was able to write a good 50MB/s faster than the SSD. This more than makes up for the slightly slower read times. HD Tune runs a similar set of read and write benchmarks, but gives us the data is a graph form. The Patriot Torqx peaked at just under 250MB/s read and 200MB/s write in the File Benchmark; an average of 178.6MB/s in the read test; and an average of 179.8MB/s in the write test. 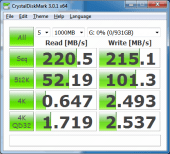 Our Momentus XT RAID 0 has similar results compared to CrystalDiskMark. A short-stroke File Benchmark of about 210MB/s read and 200MB/s write; an average of 182.1 MB/s in the read; and an average of 148.5MB/s in the write. 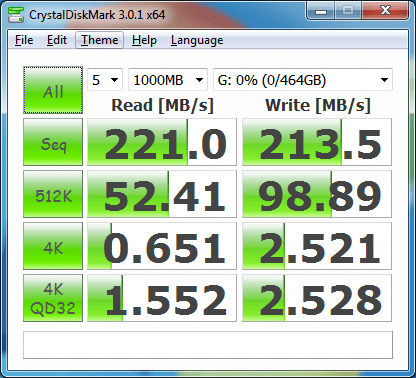 The non-short-stroked results are about 230Mb/s read and 200MB/s write, 163.5MB/s read, and 143.1MB/s write (respectively). 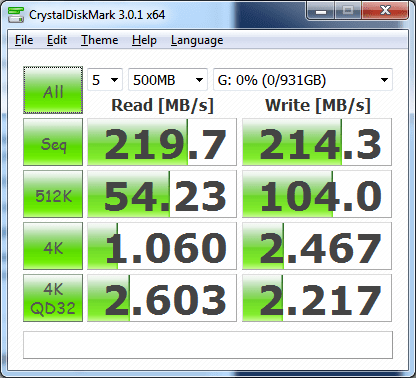 Again, the best part is how close the read and write speeds are to each other. The Momentus XT doesn’t beat the Patriot Torqx still, but it certainly comes very close. 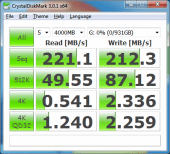 While intended for laptops, the Seagate Momentus XT is very fast. 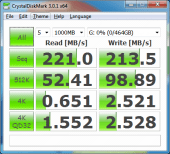 It’s not really worth it as a stand alone drive in your desktop, but in RAID, performance is fantastic (you can get a 1 or 2TB 3.5″ drive that’s just as fast for less). For about $260 you can get the same read/write as the Patriot Torqx we compared it to. For you The best part is that you don’t have to sacrifice storage, or even short stroke your drives to get great speeds. If you want a great laptop upgrade, I’d definitely recommend the Momentus XT. It’s like having a Western Digital Black in your laptop, but a lot quieter (noticeably louder than my previous 5400RPM drive (the stock HDD was a Seagate Momentus coincidentaly), but worth it). After this was all said and done, I put the Momentus XT in my Macbook Pro and I really liked it. Boots faster and access times are great. 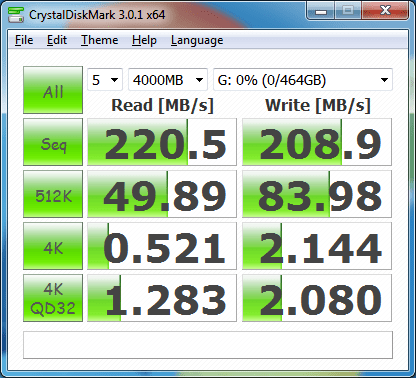 The biggest observation to be made is how much closer the read/write performance is compared to the SSD. 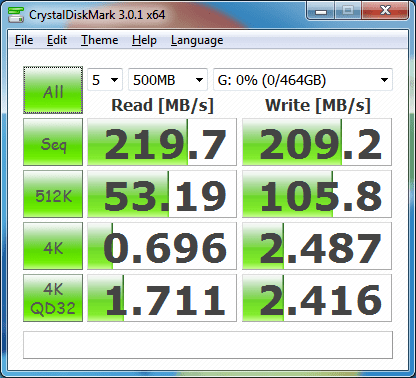 While the Momentus XTs couldn’t touch the SSD’s read speed, it did manage to greatly increase it’s write performance. If you do a lot of writes to your drive, this is going to be a great upgrade. Again, bang-for-the-buck is fantastic, but alone (as in not in RAID), the Momentus XT is not financially worth it for a desktop but excellent as an upgrade for a laptop. 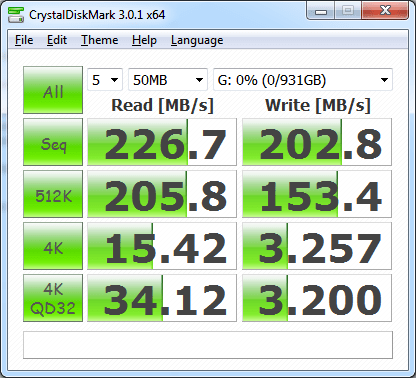 We were able to reach close to SSD speeds no problem, with a price-per-gigabyte of only $0.26. You can pick up two of these for about $260 on newegg or half that for one if you want to upgrade your laptop. Please name some models that are better choices for the money than a single XT for desktop use. Also, how did you RAID 0 the XTs? Seagate says they are not meant for that purpose and will somehow malfunction or perform incorrectly. BTW, your writing is a little weird in spots. 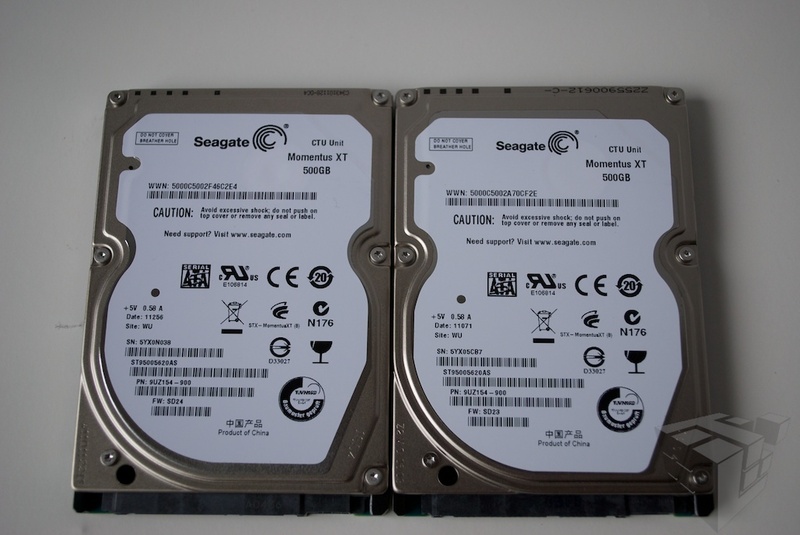 While Seagate says these aren’t great for RAID, nothing is stopping you from doing so. Seagate is simply warning you that there is a very good chance this is a bad idea and all of your data will be deleted at random. We just ran this for fun and to see what could be done. This was written when SSDs weren’t available above 256GB without going over $1000, so we wanted to see some bang for your buck. I took this setup down once the review was over, so I can’t say how stable it was in the long run. I’m sorry if the writing is spotty, but it’s too old to change now. In the future, please read dates of articles before posting. You are lucky I care enough to get back to you. Other sites won’t be as nice.